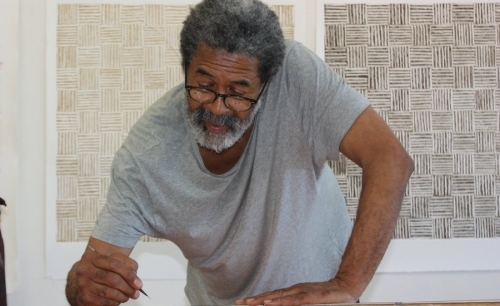 At the age of 70, McArthur Binion says he’s only just beginning. The abstractpainter spent his twenties in New York, partying with the star-studded downtown crowd, and turning down teaching jobs to paint full time. He spent decades honing his craft, but according to the spirited artist, he only began making truly great paintings this past year. And Binion isn't the only person who's excited about the work he's been making recently. Now, enjoying his success later in life, Binion is as confident as he is wise, and his enthusiasm for the emotive potential of painting is palpable. For the latest installment of our interview series around Phaidon's Vitamin P3 compendium of contemporary painting, Artspace’s Loney Abrams met the painter in MoMA'scourtyard to discuss how the New York art scene has changed since the ‘70s, Binion’s experience as the rare black artist downtown, and his secret to finding success later in life.